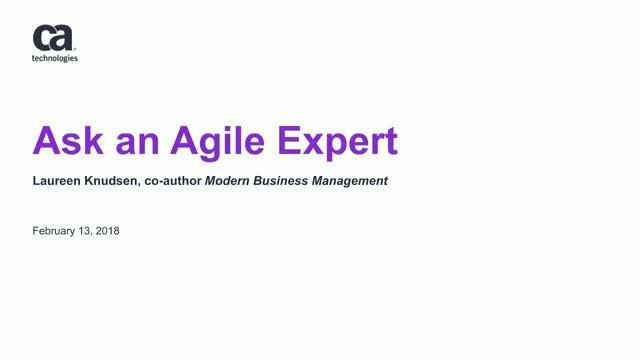 Here’s your opportunity to ask an agile expert. Every organization undergoes different pain points during their agile transformation. We've been a part of many of those transformations, and our experts can offer insights and best practices for your organization to overcome those pain points. Join Laureen Knudsen, co-author of "Modern Business Management: Creating a Built-to-Change Organization" and resident agile expert, on Tuesday, February 13, for your opportunity to ask the questions on your mind as your organization starts, expands and scales agile across multiple teams and departments.